…and if you haven’t even started a manuscript, Digital Book World still calls you an author. Congrats! Guys. If you can’t tell by now, I really love surveys. I love being asked for my opinion, and I love multiple-choice tests, and surveys sit happy at the intersection of the two. I also love what they can tell us about ourselves as a whole. Human beings can be so incredibly diverse, but there are such strong rivers of similarity that run through the cold, impartial world of statistical analysis, and I enjoy stepping out of my nebulously subjective, emotionally-based existence to examine the patterns that emerge when you strip away opinions from the hard, cold core of fact. When it comes to something as deeply personal as nurturing a novel from the first little embryo till it’s ready to ride a bike without training wheels, statistics tell us more than who is making money where. They tell us about the fear of rejection and the wild, breathless abandon of flinging a cherished work towards a stranger, hoping they’ll care. They tell us about how people create stories and how they consume them, and how technology helps and hinders the process of understanding ideas that are as old as the first word. This survey from Digital Book World took a look at 9000 respondents from all walks of the publishing life. Only 58% of them had actually finished a manuscript (and 8% of participants hadn’t even started one, so let’s take the word “author” with a grain of salt here). A third have started but not completed their work. Just over half of the 58% of people who have finished a manuscript have made it all the way to publication, whether through traditional or self-publishing means. Twenty-six percent have submitted their manuscript to an agent or editor, but without success, and they stopped there. Basically, of the 9000 people who took part, just 3400 are able to hold a book (or e-book) in their hands. 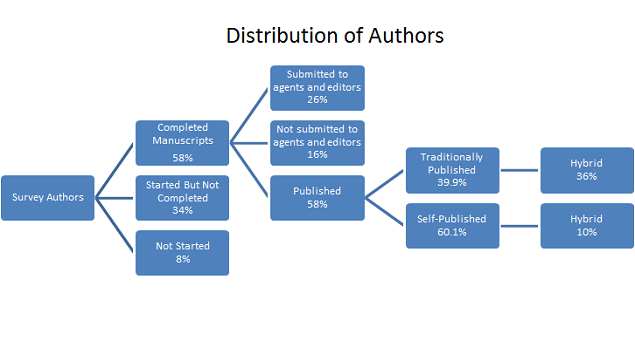 Now, of those 3400 published authors, 39.9% are traditionally published, and 60.1% are self-published. You’re 20% more likely to choose self-publishing than you are to scale the walls of the traditional industry. Additionally, ten percent of self-published authors consider themselves “hybrids,” while 36% of traditionally published authors have gone down both paths. It’s not rocket science to think that it’s easier to self-publish after getting accepted by a mainstream house than it is to get accepted by a publisher after using KDP, but it is interesting. Why does any of this matter? Well. It’s cool, right? But more importantly, it gives authors something to be proud of and readers something to think about. Put nine authors in a room, and only three of them will have conceptualized, written, edited, and polished their work enough to be seen by other people. Only one (and a bit) of those three will have a traditional publishing house’s imprint on his or her work. Think about how many times each of those authors has started a novel and thrown it out the window. Think about how many stories it takes, how many tries, how many months and years and decades of practice and luck and hard work is necessary to make it as far as your local bookstore’s shelf. It’s both discouraging for those of us who hit the doldrums with alarming frequency and amazing for those of us who are determined to navigate our way out of them again. It’s awesome for readers who might not realize just how much blood, sweat, and caffeinated tears they’re looking at when they pick up a novel, even if it’s found its way into the bargain bin or the free Kindle books section of Amazon. I love surveys because they let you see all that work boiled down to a couple of fascinating little numbers, and I love authors for putting in all the effort and love and determination it takes to become part of one of those figures on the page. So keep at it, my writing fellows. You can get there if you try. And readers, don’t forget to show a little appreciation for the people behind the stories that keep you entertained. This is certainly not a gentle reminder to leave your favorite writers some Amazon reviews or anything. Not at all. I’d never do that to you.